Last week I chronicled the fun that our children’s booksellers had with a table full of picture book samples, and there were so many stand-out picks there that we can’t wait to sell. But as a children’s bookseller, one of the titles that particularly stood out was Mac Barnett and Sarah Jacoby’s The Important Thing About Margaret Wise Brown. 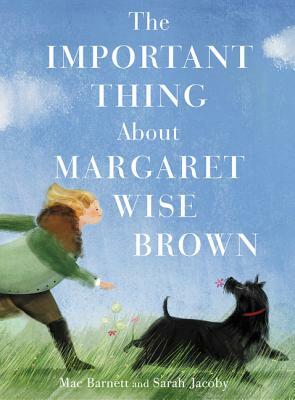 As we dip and weave through Margaret Wise Brown’s life, landing on small but illuminating moments on each page, a woman with pragmatic sensibilities, off-kilter idiosyncrasies, childlike wonder, an uncommon affinity for rabbits, and maybe even a dash of ambition comes into focus. Winningly odd and childlike in scope, it boils the life of this vibrant literary giant down into 42 pages—one for each year of her life—while very specifically not trying too hard to fit the entirety of that life into these pages at all. While we are certainly in a wonderful boom time for the children’s biography, they are notoriously hard to do well for the 4-8 audience. The trick lies in somehow situating an adult subject’s life within an authentically childlike scope or field of interest. What are children interested in, you ask? Well, they like to know what kinds of pets famous authors have. They like to think about why adults would do things like swim naked in cold water or buy out a flower cart to throw a party or have tea on the steps of a library. They like to wonder what it would be like to do those things too. And they wonder if those are the important bits about a person, or whether it’s something else entirely. Most importantly, while they think about things like that, they like to be treated seriously as curious humans trying to understand more about their world. Luckily, that’s exactly what this book does and exactly how it manages to get this profile so right. By acknowledging that the best stories from people’s lives don’t always make sense and that stories don’t need to make sense to be true, it reminds us that children’s books—even (or especially) the ones about “important” things—should spark curiosity, wonder, laughter, or even a little bit of ambition in their pint-sized audiences. Well, and that everything’s better with rabbits. It also encourages readers of all ages to decide what’s important—whether in books or in life—for ourselves, because maybe, just maybe, that’s the only way to make sense of anything at all. Although she makes a small appearance at the end, kids won’t know who Ursula Nordstrom was and probably won’t care that much about why she was important. But this book’s experiential, childlike, rabbit-filled ode to one of that famed editor’s most beloved authors feels worthy of their shared quest to make books that reflect and respect what it feels like to be a child in the world. 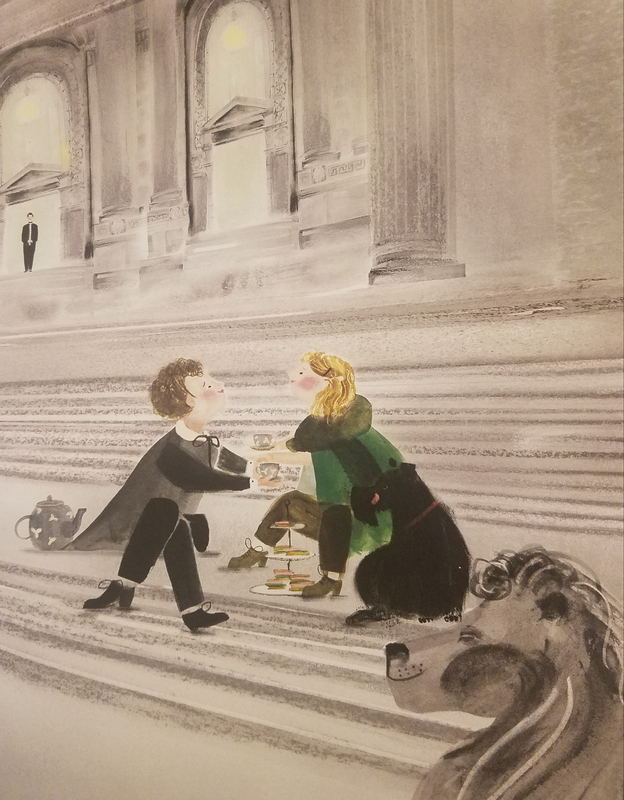 So seeing these two ladies cheerfully taking their tea on the steps of the New York Public Library, defying tradition and stodgy views about what makes a book (or a person) important, is both deeply satisfying and simply delightful on many levels. Does this all sound a little unconventional for a biography on such an important writer? Well, sure. But after all, as Mac Barnett reminds us in these pages, “Every good book is at least a little bit strange.” And that’s a sentiment with which I heartily agree. This entry was posted in Uncategorized on January 25, 2019 by Meghan Dietsche Goel. I worked for Miss Nordstrom and can imagine her loving to have tea on the steps of the library! I am so excited for the release of this title. The author and illustrator are both remarkable talents. So happy they were chosen for such an important picture book biography.